OXFAM holds a night of poetry and photos today at British Council, Maitama, Abuja by 5pm. It hopes to be a thrilling event and it is themed ‘Protection of Civilians in the North East Crisis.’ I hope that they will soon do one for Civilians in the Middle Belt too… Wait o, why not ‘Protection of Civilians in Nigeria’… Okay, we can do that one ourselves. But for now, let’s come and get inspired even as we unite in the arts to do our part in bringing the peace in Nigeria. Details? For emphasis, the date is today Wednesday 31st January 2018 and the venue is British Council, Maitama. Time is 5:00pm. Birthday post not forgotten… No matter how short, we go do am. Summary is at the end of the day, I had a running stomach despite hardly eating the whole day! OXFAM Night of Poetry and Photo Exhibition, date is today Wednesday 31st January 2018 and the venue is British Council, Maitama. Time is 5:00pm. Maybe we should learn to hate. Not to love everything, like our heart would have us do. Not to compromise on things that are more of lies, for the sake of – peace. When they piss on the centre of our souls, quenching the one thing that keeps us going –sanity. Maybe we should learn to hate? IN THE NAME OF JAZZ, GIVE US SOME SPOKEN WORD! Have you heard of REZthaPoet? He is a spoken word artiste. You might have caught him in any of the last 8 years performing at Freedomhall, Taruwa, Defunct GAP (in Abuja), ANA (in Abuja), Wordup, The Konscious Poetry lounge, Bespoke Poetry event, The Poetry Potter, The Anthill 2.0, Wordslam (Goethe Institute), W.A.P.I (British Council), Chill and Relax, Soul Nyt 2.0 and at some private events and occasions… Okay, maybe you have. Or not. Till a few days ago, I hadn’t. But Seun Odukoya (whose birthday it was yesterday, whoop! Whoop!) introduced me to him, and his art. I wondered what could come of it. Really, what new thing? I got a feel of him, the album Ex-Posit Deluxe Edition. I struggled through a million events and heart matters to find space to listen more, which I did eventually. It was not something I was overtly used to but the jazz fusion that accompanied sharp rhymes and lyrics filtered into my ears. Ex-Posit Deluxe Edition is REZthaPoet’s sophomore collection. It starts gently with some jazz that could have come in from the heart of the black American pots, where the real soft music is made. As you slowly listen to the 16 second introduction, you are eased into ‘Awoof’, where REZ’s voice comes in to seize the jazz and make it all Nigerian. He paints Nigerian situations that go ahead to show that the easy way out isn’t always the right way, ‘awoof dey run belle’ – cheap things have ends that can make you sigh in the end. If you need some motivation, then there’s ‘The Future’ where REZ becomes the philosopher putting words in the right positions to talk to your heart and get you listening. The future… is you. At the end of it all, one comes to a problem of whether to place REZ as a rapper and his collection as a fusion of rap or soul/jazz as against the spoken word that it is meant to be. But again, who says it cannot be all – rap, spoken word, soul and jazz? Whatever it is, this album is full of lyrics, rhythm and punch lines that serenade. It is a decent production with good finishing. Ex-Posit Deluxe Edition is officially up for release on the 25th July, 2016. It is worth listening to, especially if jazz and soul is your thing. Get it if you can and if you find any place where REZ is performing, find your way there. It would be worth your while. So, very worried, I walked up to the stage – My God! Is THAT what they think I do? Swiped wet palms down my jeans, then turned to face a difficult evening. It was the celebration of Ghana’s 50th Anniversary, you see, by the Afro-Caribbean Society (I think), at the School of Oriental and African Studies. 2007 in Central London, and I was looking at an auditorium sky-high on funk. My brother, no lie, I have never felt more out of place. What? With my ‘daddy’ jeans (as my wife still calls them), and type written poems in shallow back pocket. But, all the same, what could I do? I took a deep breath, held both hands up and – right there, right then – I told the truth. I cannot rap. I cannot dance. (Loud boo-ing in the corners.) I cannot hold a note to save my life. But (pulling out the notes I actually had) I have something to say. That day, I clung to the lines completely, did nothing at all to modulate my delivery. No sudden highs or dramatic lows, just read the words in front of me. And at first only the sickening murmur of people talking, talking like I wasn’t there. Ah! I willed my voice to hold steady and, reading on, it began to wane; that sickening murmur of people talking, it waned and waned till there was silence. My words alone above their heads, their eyes all locked on me, as if they feared even to breathe, to gasp and lose one syllable. The feeling? Ah! I cannot describe it – to see something so powerful, so self-assured and confident; to see something so powerful stood there on quivering legs. Yes. And it does not matter how long it’s been. Honestly. Did you know? When I walk to a stage, up till this day, I walk as if I know where I am going. But all the way there, you know what I’m thinking? My brother, I’m thinking – You this boy, where the hell are you going? True! And it makes me laugh, so I tell my friends – creativity, you see, is actually a curse. For no matter how bad it gets (and – believe me – it does) the true artist is doomed to try again. To write, and write for writing’s sake. To read a poem and trust, that words alone – no razzmatazz – can touch the listener’s heart. To seek that distant legacy, not hyped or pimped or marketed, of works that soar because they strike at something in the soul. For that alone, we reach! I tell you. September 2013. And you know what the said? 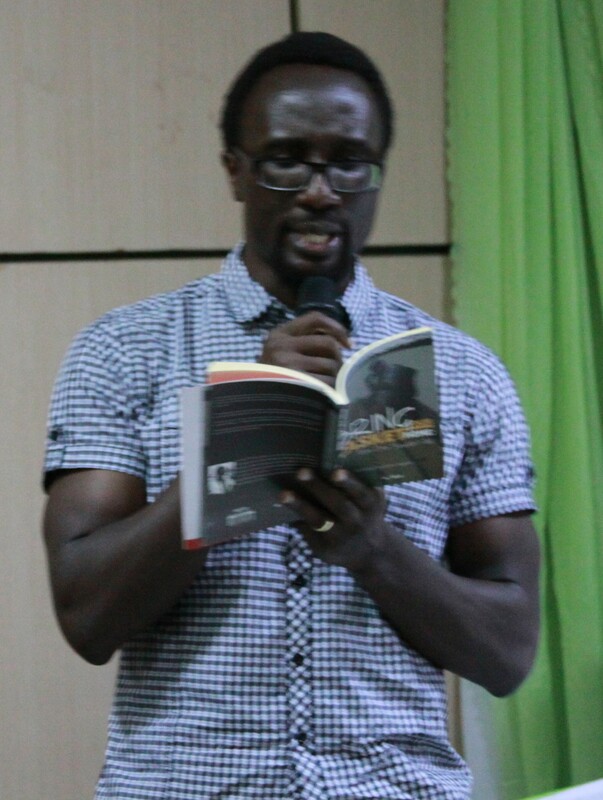 That there were not enough poetry lovers in Abuja to fill even the smallest room there, no matter it was free! 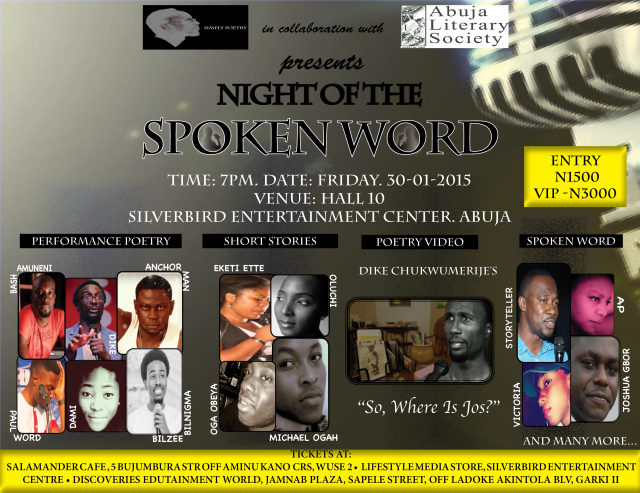 They said that there were not enough poetry lovers in Abuja to put on a hundred and fifty seats! And we said, Let’s see. That night we were standing all the way to the door, not a seat left anywhere. And January 2014, it happened again, sitting on stairs, not a seat left at all. September 2014, try a larger room. Let’s see what happens with a 300-seater. You know what happened? Not a single seat left. And so they said, No way! It’s because it’s free. Just gate it and see! Poetry, my friend, cannot pay for itself. Dike Chukwumerije is a Spoken Word Artist, Novelist, and multiple award winning writer. 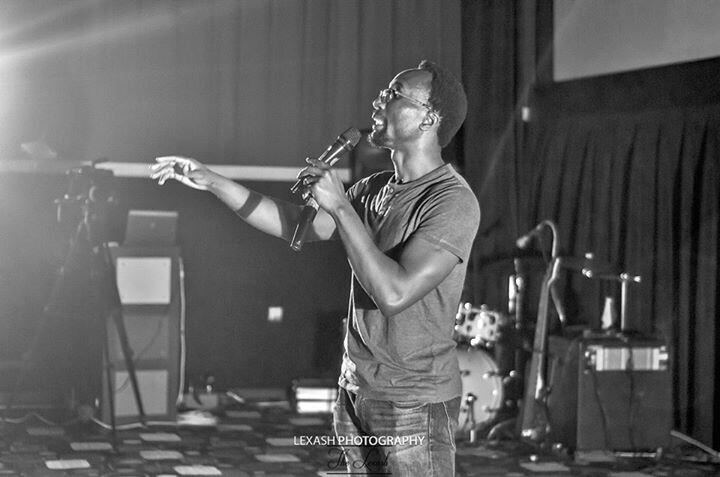 Follow his blog here… and ensure you make out time – wherever you are in the world – to attend Abuja’s NIGHT OF THE SPOKEN WORD 4! Nigeria’s number one Performance Poetry and Literary show! READING BUZZ: The Symbols Cuisine Gallery. 8:20pm. 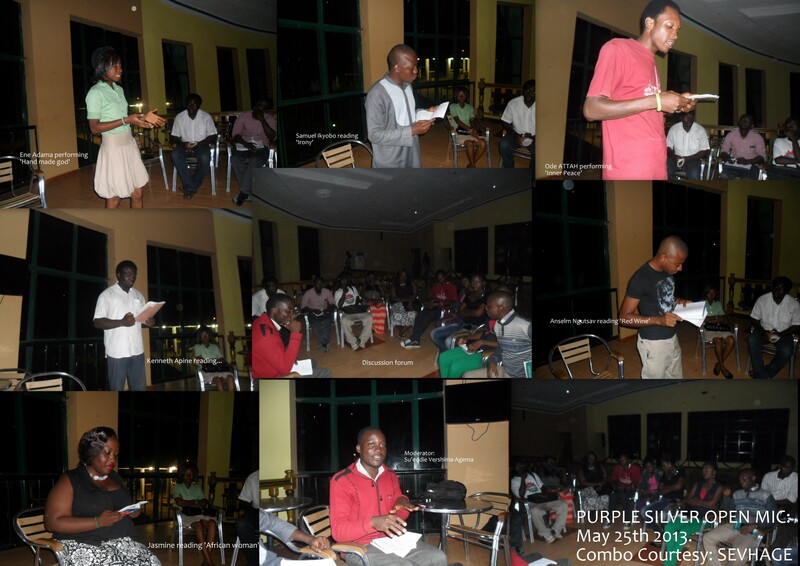 It was the Purple Silver Open Mic session. WE had our discussion forum and continued with our readings/performances. The last poem was from Jennifer Jasmine Yahaya who read ‘African woman’, a woman of great pride and great breasts feeding lions. She started by craving our understanding as she was performing for the first time. Hmm. We expected the worst but she was really nice. The feeling I had was of Chimamanda Adichie and Toni Morrison in some strange combination. It seems I wasn’t the only one affected as there was a general ENCORE cry. She performed beyond par. A few questions were asked on inspiration, themes and the like. Announcements: Well, first and foremost, SEVHAGE in collaboration with the Writers’ League is bringing award winning poet, writer and deep critic, Prof. Musa Idris Okpanachi to Makurdi on Wednesday for a reading at the Benue State University, Makurdi. The main book to be read is his great new book, From the margins of Paradise. Time is set for 4pm and the tentative venue is the ALGON Hall.